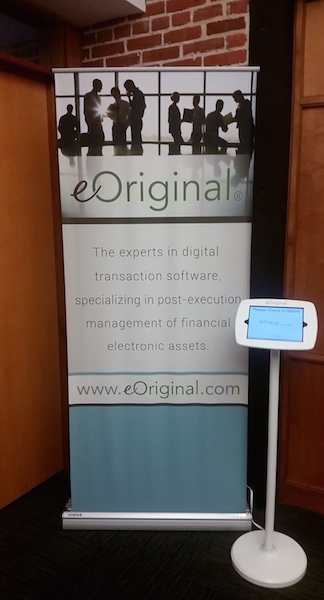 eOriginal is the trusted expert in digital transaction management solutions, specializing in the post-execution management of financial asset documentation. As a result of its continuing success, eOriginal has recently transitioned into a larger office space to accommodate its growing staff. The expansion nearly doubled the company’s workspace in the Warehouse at Camden Yards, a historic Baltimore building that’s connected to Oriole Park. According to Adam Attinello, Vice President of Software Engineering, the expansion was an opportunity to update the office environment. To better reflect eOriginal’s image as modern and tech-savvy, they renovated staff working areas and chose new décor. They also chose The Receptionist for iPad. “The Receptionist for iPad gives a very high-tech impression right away when someone comes into the office,” Attinello says. “The look and feel is very modern, clean, and minimalistic, which is the image we’re always looking to achieve.” That “look and feel” is just one of the reasons eOriginal chose The Receptionist for iPad over other options. They were also impressed by the cost effectiveness, the fully web-based management system, and the ease of branding the product with their logo. The ease of set-up was important as well. “It was very simple,” Attinello says. “We ordered an eOriginal branded stand and put that out front with an iPad in it, and we were ready to go.” The Receptionist for iPad has earned positive reviews at eOriginal, from both guests and staff members. Guests find it easy to navigate. And since eOriginal doesn’t have a dedicated receptionist, staff members appreciate the targeted notifications. “Traditionally, our office manager or someone sitting close to the front door would be forced to stop what they were doing and get up whenever someone rang the bell,” Attinello says. “Now when visitors come in, they don’t have to bother the people sitting near the front of the office.” Staff members also enjoy the two-way communication feature, especially given the layout of their office space. The building they’re in is a quarter-mile long, and their office is long and narrow. So it can take a while for employees like Attinello – who is situated on the far end from the door – to get to the front to welcome visitors. “It’s very beneficial that when someone checks in, I get a text and I can let them know I’ll be there in a minute,” he says. “They know that they’re not just there waiting, because I’ve confirmed that I’m on my way.” Jessica Larkin, content marketing manager at eOriginal, adds that The Receptionist for iPad helps eliminate potential confusion for guests who might otherwise miss someone in passing. “It really streamlines things,” she says. “And it impresses our visitors that we’re tech-savvy in everything we do.” When asked about eOriginal’s overall experience with The Receptionist for iPad, Attinello sums it up succinctly: “We’re very happy.” That’s what we like to hear! We love to support high-tech companies like eOriginal, and we’re proud to count them as satisfied members of The Receptionist family.